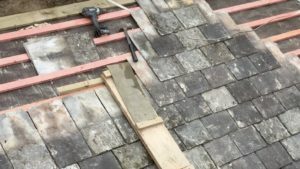 We have extensive experience of reroofing ecclesiastical or other historic buildings in slate and tile. We understand the complexities and hidden problems that are often associated with historic buildings and approach the work accordingly. Whether it be reordering a lead valley or re-roofing a church tower, we have the in-house skills to undertake the works both to a high standard and sympathetically to the existing fabric.